China has unveiled its own mobile platform, dubbed China Operating System (COS) with the aim to break the monopoly U.S. tech giants Google and Apple currently have in the market. The state-approved and government-funded operating system was developed jointly by China's Institute of Software at the Chinese Academy of Sciences (ISCAS) and Shanghai Liantong Network Communications Technology, Sina news reported on Thursday. COS is based on Linux and serves as an operating platform for PCs, smartphones, tablets, and set-top boxes as well as supports HTML5 applications. However, due to "safety concerns", COS is not an open source system, revealed a 21cbh.com report. The OS has one application portal, similar to Apple's App Store. There are several security issues with open source operating systems, including Ubuntu and Android, where hidden security vulnerabilities make it easy to control personal devices, the report added. Moreover, launched by foreign companies, these open source platforms also "failed to acclimatize" in the Chinese market across many aspects, including user's interface, input method, speech recognition, cloud service stability, application downloads, and support, among others, said director of ISCAS, Li Shuming, in a NetEase report. Learning from the essence of other open source software, the underlying codes and user interface of COS were all built independently, Li added. He said the platform addressed security issues, and consumers who are familiar with Android will also find it easy to start with COS. He noted that the Linux-based OS also aims to break the monopoly of foreign applications. Currently, 100,000 applications are available on the COS, according to local reports. A promo video of COS uploaded on the internet revealed that variants and features of operating system were very Android-like. 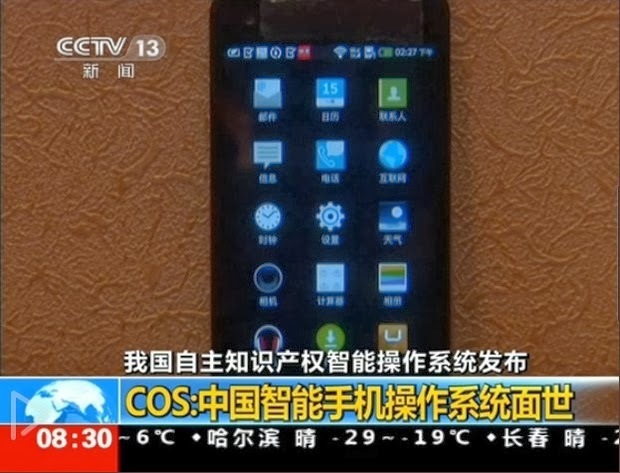 China's online community also questioned how COS was able to launched with 100,000 apps, with some summizing that the Chinese platform was "just an OS based on the open source Linux and a strong imitation of Android system".